Anne studied sculpture at Art School and went on to spend twenty years as a dancer which she regards as sculpture in motion. Anne has recently discovered the joys of creating brooches, earrings and pictures from polymer clay. She begins by sculpting the shape she wants and baking it before painting on layers of colour and detail then finally varnishing. 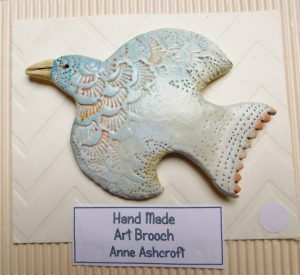 Anne’s brooches are finished to a high standard and the earrings are two-sided to give a 3D effect.